Regain control over your time! See the whole year on one screen. yCal is a powerful and versatile calendar app featuring a unique "months by column" year view plus ample marking and note taking options and central holiday and birthday management. Designed from the ground up to make a better desktop calendar, its unique year view gives you a perfect overview in a fraction of a second. Days can be marked in different colors and styles to give you more information (e.g., to show days of vacation, times of travel etc.) – just like on a normal paper calendar. The full year can be shown side-by-side with the week view, giving you more granular access to individual events. Optimized for minimum user interface overhead. Hit space in the year view to quickly look at the details of a selected day, or just start typing to add a note. Swipe left or right to scroll through years and weeks. 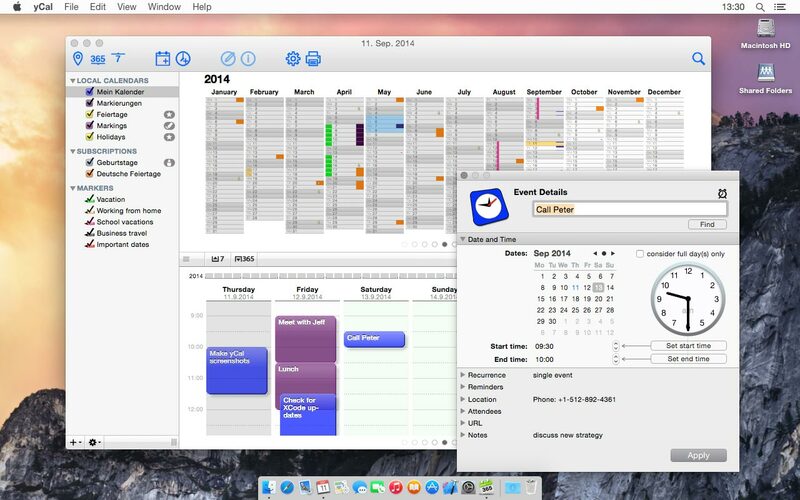 yCal seamlessly integrates with calendars set up in OS X – there is no proprietary data store. yCal operates on your local machine's calendars, and if you run Apple's iCal or Calendar app in the background, you also have access to data from your CalDAV servers, iCloud, or from wherever else without the need for importing or copying. Note that yCal does not provide native CalDAV access to calendar servers as of today, but you may use Apple's iCal or Calendar app to sync yCal data with those calendar servers. Gunnar Wehrhahn, 25-Mar-2013: "Great! Markers are the last reason for me to have a big paper calendar at my wall … So it's a great opportunity for seeing at a glance what's going on during the year." Mr. Generally, 28-Feb-2013: "I've been looking for a nice yearly calendar for a long time. I just don't get along with this block layout found in most calendar apps — and I really love this one! It's just great to highlight days or weeks and have the whole year in sight. Setting up and using those "markers" may not be overly intuitive, but works great once you figured it out. The app picked up all the calendars I have configured in Apple Calendar, and data is synced instantly. [...] Bottom line: great app with innovative features — and well worth its price." Peter Hanitzsch, 17-Feb-2013: "Bought it this moment because its translated into the german language too. And because I find it very important to have a good working cal with a yearview. The features are great and the price is ok. A big thanks to the developers!" WhizBits — Lothar Baum and Thorsten Kramp. We share a passion for design, simplicity, and functionality, and we try to live and show this passion in the software we create. We care about our software, and we care about you (our user)! And we are committed to continuously refining and improving what we create. So if you have suggestions, are annoyed by something, or have questions — please let us know! Mac OS X 10.7 or newer.